The convention will continue the following morning with registration beginning at 9:45am. Registration fee is $5.00. **If you have a Junior that would like to perform on the Junior day recital please send the following information to Barbara Hildebrand. 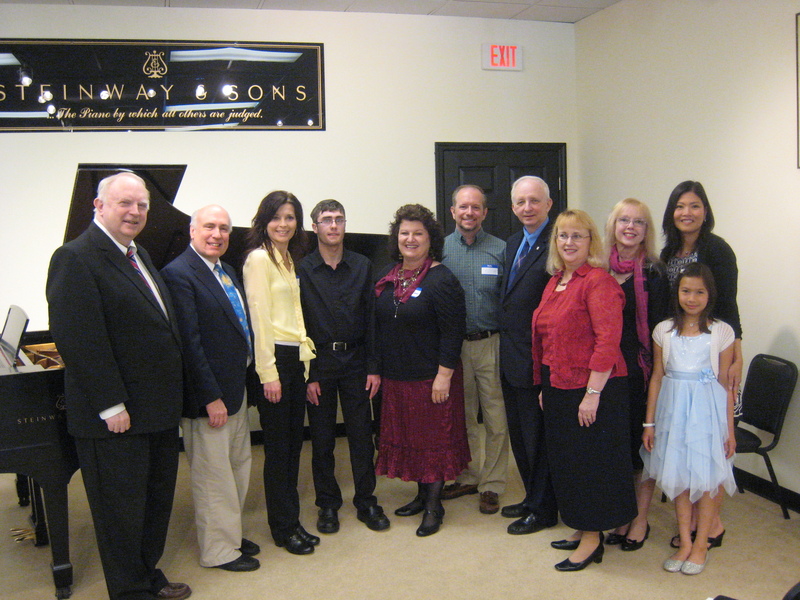 Students name, age, instrument and (classification for piano MDI or Above), All other instruments are welcome to perform at any level. 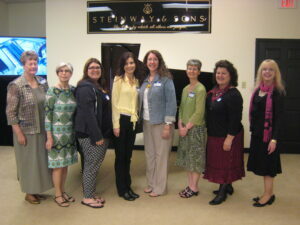 The TFMC State Convention was held at the Steinway Gallery of Knoxville, TN. 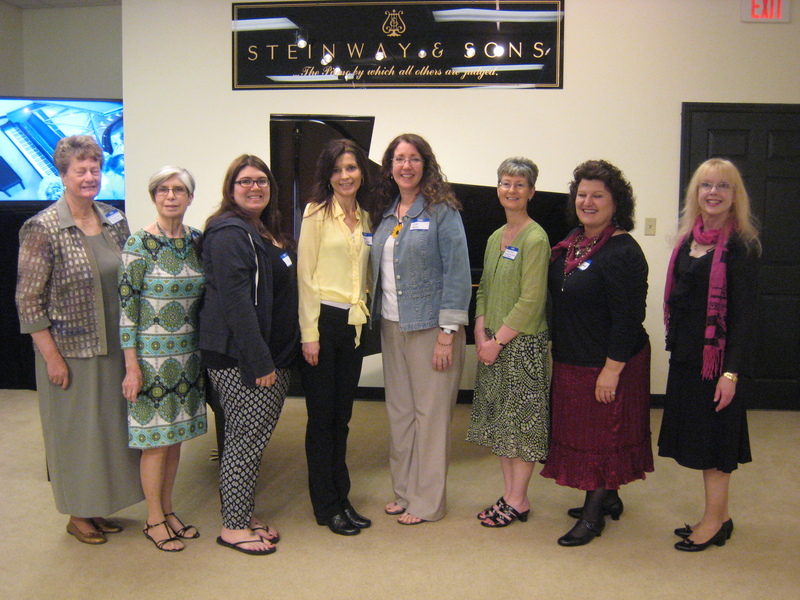 The program was devoted to Tennessee composers and the Tennessee Junior Composer winners for 2015. The Junior state winners were present to perform their pieces, Jackson Lough, Class I 2nd Place,”A Flat Tune”; Keira Shafer, Class I, 1st place,”Christmas Bells Are Ringing Tonight” Benjamin Larson, Jr., Class III 1st place, “Mystic”; Ryan Flint Class IV !st Place “A Day in Copenhagen”. Adult Composers performed Janie Gilliam, Jeanne Costello, David G.K. Howe, Thomas Boduch, several students of Myra Brooks-Turner performed her compostitions. The featured composer was Myra Brooks-Turner, teacher, composer, and active member of TFMC, and NFMC. A special engraved silver tray was present for her outstanding contributions. Beth Bush was sworn in by national guest, Barbara Hildebrand, as the TFMC state secretary. Savannah Turner, TN historian reported on progress origanizing recent Tennessee history; includuing questions on early Tennessee Federation History. The Trophy of Menus Cookbook is here!!! “Bucks for Brevard” was adopted as the campaign slogan for the SE Region scholarship. The Trophy of Menus Cookbook was published to raise money for a SE Region student to attend Brevard summer music camp. 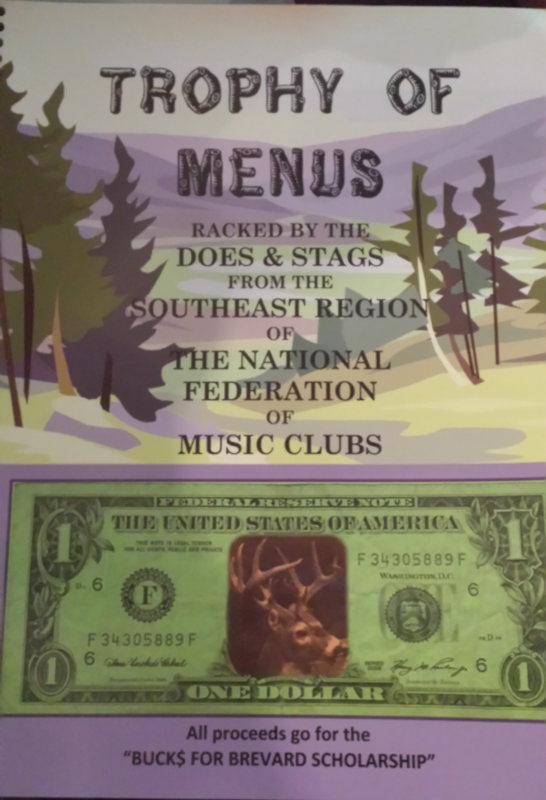 The format of this cookbook continues our “bucks” theme. We have used “deer” dialect in selecting our categories. Our members wanted a different cookbook…not just one with recipes; so we came up with the idea of menus. In our SE Region Cookbook Index, you will find our clever categories. Herd Menus are family favorites; Doe Brunches, Luncheons, and Teas are mainly ladies’ favorites; Stag Menus interest men; Fawn Menus are children friendly; Whitetail’s Holiday Menu are special occasion meals; Herd Winter Stash include summer bounty saved for fall and winter; Deer Trough include beverages; The Big Hunt- State to state include our friend’s favorite menus/recipes from other states; Extra Points are actually single recipes sent not in menu form from members or friends; and last but not least, Trophy Room Recipes are out treasured vintage recipes. Contact Barbara Hildebrand to order your cookbook.